Never a dull moment in the cannabis universe! We received a letter in the mail that we felt compelled to share with the community. My guess is that this is commonplace, but it's the first of its kind that we've seen/experienced. Way back when, in conjunction with the Lemonhaz Top Charts, we also created a specific product page for each cannabis product we track in the WA market. More about that here. Essentially, these pages were dynamically created from our product database. In fact, we once got a shout-out from Page Six of the NY Post, regarding the Monica Lewinsky marijuana strain. There is a processor in WA State that has a vape pen with the strain name of: Jolly Rancher. Here is a link to that product page. 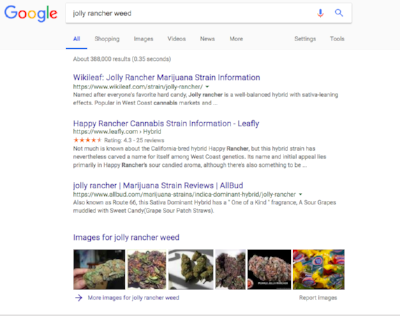 In fact, if you search for "jolly rancher weed", you will see THOUSANDS of results matching that term...Lemonhaze btw is not even in the first 5 pages. Below is the certified letter we got from a law firm representing Hershey Company (HSY). The irony of all this is that the letter states that "it has recently come to our attention that you are advertising and selling products that incorporate the Jolly Rancher trademark on your site". The reality is that we do NOT sell weed via our site. It's illegal. We also do not advertise/generate revenue from ANY these pages. Curious if any other brands or shops in our industry have been on the receiving end of similar legal letters. Please share any and all similar experiences. Marijuana has intoxicating effects and may be habit forming. Marijuana can impair concentration, coordination, and judgment. Do not operate a vehicle or machinery under the influence of this drug. There may be health risks associated with consumption of marijuana. Marijuana is for use only by adults twenty-one and older. Keep out of the reach of children.